MENIFEE, CA--(Marketwired - May 16, 2016) - Province by Brookfield Residential, the first spectacular gated neighborhood in the master-planned community of Audie Murphy Ranch in Menifee, is now selling, offering homebuyers an opportunity to own an elegant new home in an exclusive elevated location. Tour the single-family collection's three beautifully appointed one- and two-story models and experience the exquisitely planned interiors showcasing expansive great rooms with soaring volume ceilings; media rooms for family gatherings; spacious secondary bedrooms; a coveted outdoor room included in Residence One; and two-car garages plus super storage. Customizations to your home are also available such as additional room options, extended patios, private dens, versatile bonus rooms and optional outdoor rooms in Residences Two and Three. Homebuyers ready to enjoy life behind the gates of this magnificent neighborhood are encouraged to visit the Province sales gallery today and join the interest list to stay informed. In addition to Province, a number of other exceptional single-family detached home opportunities are currently being built by premier homebuilders in this naturally breathtaking setting within Audie Murphy Ranch. New neighborhoods include Richmond American Homes' stunning Horseshoe Ridge; the enchanting Remington neighborhood by Woodside Homes; KB Home's beautiful Silvercreek; and the greatly appealing Palomino built by Richmond American Homes. Those interested in exploring any of these captivating collections are encouraged to join the Interest List at www.AudieMurphyRanch.com. "Since Audie Murphy Ranch debuted, interest is soaring with homebuyers coveting the opportunity for gated privacy, expansive home designs, large view-homesites and private amenities," said Mercedes Meserve, Vice President of Marketing for Brookfield Residential Southern California. "Don't miss the opportunity to see this master-plan's beautiful new-home neighborhoods. Audie Murphy Ranch is undoubtedly the perfect setting for your family." The brand-new Province by Brookfield Residential offers a luxurious gated setting with spacious single-family designs spanning approximately 2,949 to 3,488 square feet. Interiors feature three to six bedrooms and two and one-half to four and one-half baths. Prices start from the $400,000s. Priced from the low $400,000s, Horseshoe Ridge by Richmond American Homes showcases an array of one- and two-story homes spanning approximately 2,800 to 3,800 square feet with three to six bedrooms and two and one-half to four and one-half baths. Remington by Woodside Homes is priced from the high $300,000s and features spacious one- and two-story designs ranging from 2,351 to 3,199 square feet with three to five bedrooms and two and one-half to three and one-half baths. Priced from the low $300,000s, Silvercreek by KB Home offers one- and two-story designs spanning from approximately 1,698 to 2,697 square feet with three to six bedrooms and two to three baths. The one- and two-story homes at Palomino by Richmond American Homes include three to four bedrooms and two to three baths in approximately 2,320 to 3,122 square feet of living space. Call for availability. The master-planned community of Audie Murphy Ranch is set amidst 1,100 rolling acres of homes, parks and timeless beauty with convenience to local hotspots including the Menifee Countryside Market and the future 12.2-acre Menifee Town Center, which is under construction and planned to include popular restaurants, retail and entertainment. Framed by magnificent trees and century-old rock formations, the rugged silhouettes of the San Jacinto and San Bernardino mountains provide a majestic backdrop to this special destination. Developed by Brookfield Residential, the master-planned community provides a variety of new home neighborhoods for classic family living. Bordering an ecological preserve, Salt Creek is in the center of Audie Murphy Ranch, while miles of meandering trails and paseos link residents to community amenities. Outstanding recreational opportunities are scattered throughout Audie Murphy Ranch, including the 11-acre Sports Park with its soccer fields, baseball fields, skate park and playgrounds, as well as the newly opened Spirit Park and The Plunge, which is scheduled to open this summer. Students have access to a great education within the Menifee Union School District and Perris Union High School District, as well as charter school opportunities. The community's location near I-15 and I-215 offers convenient access to business and leisure in San Diego, Orange County, Riverside and San Bernardino. Residents are also near Menifee Lakes Country Club, fishing at Diamond Valley Lake, local equestrian stables and The Elsinore Diamond Stadium. For more details, please visit www.AudieMurphyRanch.com. For more information about Audie Murphy Ranch, visit www.audiemurphyranch.com. 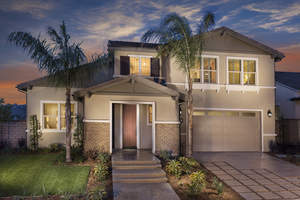 Discover exclusive, private new homes at Province at Audie Murphy Ranch in Menifee.